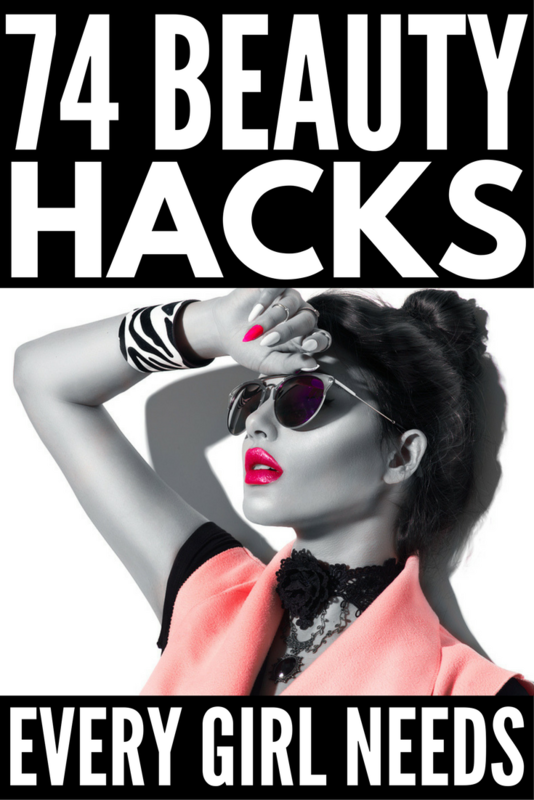 If you’re looking for beauty tips to save you time, money, and hassle, check out this FABULOUS collection of 74 beauty hacks every girl should know! These tutorials are filled with great ideas and the makeup tricks have made a HUGE difference in helping me look and feel my best without sacrificing precious time (that, let’s be honest: I don’t have)! Here’s to a fabulous and beautiful year ahead! The Milk of Magnesia trick in this beauty hacks video is AWESOME! Wayne is such a fantastic makeup artist and really knows his stuff. He has some great ideas for makeup that work IRL (not just in photos and online). For undereye circles, he suggests using a color corrector, rather than concealer. The peach and purple tones counteract dark purple and blue. Try Physician’s Formula Mineral Wear Color Corrector if you’re looking for an inexpensive option to try this hack. These tricks for fixing broken lipsticks, getting bobby pins to stay in your hair, and getting your perfume to last all day are brilliant! Nicole is so hilarious, and I love how she really tries all of the hacks to make sure they work. Her lipbalm hack is a really great double-duty use and so is the BB cream idea. I love that she’s a Vaseline fan. It’s such a great beauty hack basic that EVERY girl needs to have in her kit! I especially love the trick for contouring and getting the perfect cat eye! Plus, these Buzzfeed videos are seriously funny (and realistic). The face wipe hack is a total timesaver. Definitely keep some on hand for days when you don’t have time (or just feel too lazy). Dry shampoo is another must-have. If you haven’t tried it yet, it will change your life. The Q-Tip and scotch tape hacks in this video are fantastic! She has great tips on layering cream and powder eyeshadow for longer wear. If you haven’t tried this before, it REALLY works and will have your eyes looking great ALL day long. Use a shadow stick if you’re new to cream eyeshadow, for easier application. Your eyes will look amazing with these eye makeup hacks! These beauty hacks for getting lipstick to stop smudging and to stop frizzing are awesome. And the dry shampoo trick? ABSOLUTELY AMAZING! I really like the hair-twist for split ends hack as well. One of my favorite ideas in this video is the hack to get the last little bit out of makeup tubes. Rather than having a bunch of messy tubes sitting around, get a few travel-sized jars to keep things neat and tidy. No more wasted makeup! This video is full of great beauty hacks and ways to use everyday items in your beauty routine. Johnson’s Baby Shampoo is a must have for the makeup brush hack! Beauty Blenders are universally loved by literally every makeup expert out there. If you haven’t tried them yet, you might wonder what all the fuss is about. Once you use them you’ll see–there’s no better way to get an even, natural-looking makeup application. They are a serious must-have beauty hack secret. These beauty hacks are great for every makeup user from newbies to pros. The best part? They use regular everyday items (hello, Scotch Tape and Vaseline) that you already have on hand. Hack your makeup routine like MacGyver and get out the door quickly with these awesome beauty and makeup tips! If you found these beauty hacks every girl should know helpful, please share them on Pinterest! And if you’re looking for more beauty-related tips and tricks, please follow our Beauty board where we share all kinds of great ideas to save you time!